Versatility by design, Colonial by style, our Amish Made Victoria's Tradition Armoire is a must for adding storage to your bedroom suite. Bench built by skilled Amish woodworkers in the heart of Ohio, using the finest North American hardwood, each piece from this collection is made to an heirloom quality that is sure to be a family favorite for generations to come. 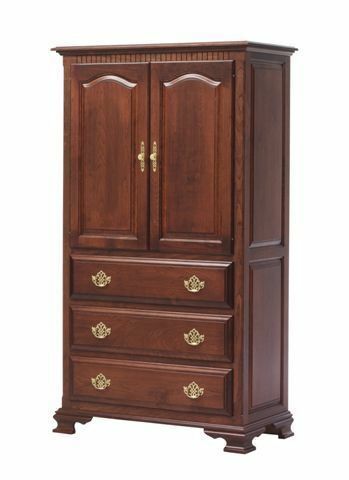 As the jack of all trades, our Victoria's Tradition Armoire can be used to store clothes, linens, blankets, or modified with a clothes bar to serve as an extension of your closet space. The top cabinet comes standard with two doors that open to reveal two adjustable shelves. Modify them to suit your needs for storing jeans or blankets, for easy access when you need them. The optional clothes bar can be attached to the inside of the top cabinet, giving you a place to store your delicate items, keeping them out of the normal closet cycle and still giving you the chance to have them at a moments notice. As an added option, your new armoire can serve as the entertainment center for your bedroom suite, offering a place to keep your television and cable box or DVD player, where it is out of sight when not in use. Add the pocket doors, DVD shelf, TV swivel and knockout back panel, providing a clutter free look without missing out on your favorite shows. Since each piece in our catalog is custom made for you, you choose the hardwood and finish options that best suit your unique decor, pick your favorite hardware and let us know your selection so we can start building the bedroom suite of your dreams. Call one of our Amish Furniture Specialists today with any questions you may have or to start your order by phone. Toll-Free (866) 272-6773.